Initially, when I looked at this image, I saw a church with three star-pointed towers and rays of light emerging from each of the three. The roofs are all triangular shapes, and the symmetry around a central axis means that the whole image appears like one triangle on top of another. 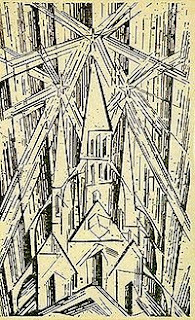 Furthermore, the light beams bursting from the stars run parallel to the angles, completing the triangular imagery. The background, meanwhile, was composed primarily of vertical lines. The lines appear to go straight up and down behind the building, even though the lines (by themselves) are actually angled. Because of the depth indicated through the lighter shading of the forward parts, the background appears to be parallel lines (though again, they're not strictly parallel when examined closely). On its side, the image loses almost all of its visual symmetry. When I rotated it 90 degrees counterclockwise, I instinctively rotated my head to view it. Just like a violin that loses its power when placed on its side, this picture also loses its. "A painter paints the appearances of things, not their object correctness; in fact, he creates new appearances of things." The painter Ernst Ludwig Kirchner said these words in 1927. I find them especially applicable to the readings that we did by Livingstone, Solso, and Arnheim. These readings discussed the role of the artist to recreate the world in their art, but also the opportunity they have to reinvent the world in their art. nd then transferring it back onto a 2-D surface, but with the attempts of making it look 3-D. The mental gymnastics required for such a task are truly mind boggling, and something I never before realized had to occur. It seems that the same clues our brain gets from the 2-D image produced by the retina are the same clues that artists use to portray a 3-D world with a 2-D surface. These tools are perspective, shading, occlusion, haze, stereopsis, and relative motion. For example, in terms of perspective, the further away an object is from the viewer, the smaller the image that is cast on the retina. Thus our brain processes this information to say that as objects consistently get smaller, they consistently get further away. This is exactly what artists do with perspective. They use converging lines to map out the mathematical "shrinking" of objects the further away they become from the eye. So, when we look at a painting using perspective, we see the laws our brain has already registered as truth and convert it to the information given to us on this 2-D surface. Once again, as objects consistently get smaller, they consistently get further away. What is interesting is when artists play with rules like perspective to create a new world, instead of an exact representation of the "real" one. Arnheim discusses this in his chapter on space. He mentions Giorgio de Chirico, the artist that I happen to be studying in conference. Surrealists like de Chirico base their art off of re-creating what is portrayed as "real," that is, painting realistically a world that could not physically be realistic. 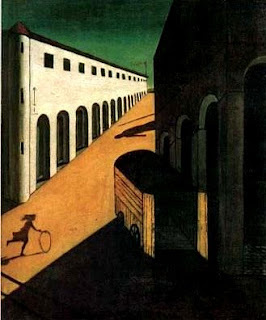 De Chirico used perspective, but used it in "incorrect" ways. At first glance, his paintings seem to make sense, but one is left with a feeling that something is off. This is because de Chirico uses more than one vanishing point, but none of them in the "correct" way. Traditional perspective uses one horizon line that all of the vanishing points go to. It is in this way that perspective is created; it seems as though everything is receding in the same direction, just as it appears when we look at the world in real life. De Chirico created vanishing points along different horizon lines, breaking the rules of ordinary perspective. Some of the horizon lines are within the ground of the painting, some are in the sky of the painting. This gives us an image of impossible space. Renaissance perspective is meant to recreate the world accurately, setting the viewer at peace that what he is seeing is correct and familiar. De Chirico's perspective is meant to recreate the world inaccurately, making the viewer uneasy. His paintings have a sense of space, a real, defined sense of space, but it is also a sense of uneasy space, uncertain space, in fact, impossible space. I think de Chirico is a wonderful example of what Kirchner is saying when he says a painter "creates new appearances of things." I think it is the role of the artist not only to "copy" what we see, but challenge what we see, to present us with a new and interesting way to look at the world.